Integrate your bot into any communication channel or CRM through our standardized API. Connect your bot to any communication channel or fallback system to provide smooth experience for all users. 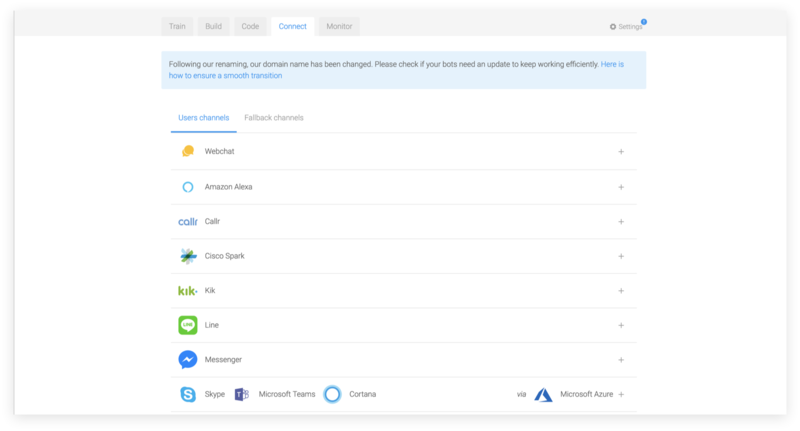 Connecting to multiple channels is easy: Bot Connector transforms all bot messages into one standard format compatible with all channels. Customize your bot experience with a native support of text, images, cards, buttons and rich messaging features from different channels. Connectors to CRMs, allowing you to setup human fallback during conversations. Message format standardized to address all channel specs in one API call. Native customization of your messages through images, buttons, lists or cards. Missing a connector? Both Bot Connector and the webchat are open source, all developers can contribute.